4.7.10 Governments have to present the Required Supplementary Information (RSI) to meet the minimum financial reporting requirements. RSI generally includes schedules, statistical data, and other information. If the government prepares comparative financial statements, the RSI should include information for both years with exception for the MD&A which should include three-year data in the condensed financial statements. Revenue and claims development trend data (for public entity risk pools). 4.7.30 The management discussion and analysis (MD&A) should provide the users with an introductory narrative, overview and analysis of the basic financial statements. Although it is required supplementary information, it should be presented first – before the basic financial statements. It introduces the basic financial statements and notes and is meant to guide the readers through those statements and notes. 4.7.40 The MD&A should be written by financial managers, the controllers, finance directors, etc. It should be objective and easily readable. The objectivity is a result of being solely based on the information that comes from the basic financial statements and facts that are currently known  to the managers. It should discuss both: the positive and negative outcomes of the government’s operations. The governments are encouraged to use charts, graphs, and tables to enhance the understandability of the MD&A. 4.7.50 The MD&A should focus on the primary government. The decision whether to address matters related to component units depends on the size of a particular component unit (in comparison with other discretely presented component units) and the nature of its relationship with the primary government. Any discussion in the MD&A involving both the primary government and its discretely presented component units must be distinguishable between the two. 4.7.60 The content of the MD&A is specifically required set of information that the government must address. Since the MD&A is a required portion of the RSI, it should not contain additional topics that are not specified here. However, the government is free to provide whatever level of detail it feels is appropriate in addressing each topic. 4.7.70 The discussion portion of the MD&A should describe the financial statements and the significant differences in the kinds of information each statement provides. It should focus on the relationship between governmental funds and governmental activities. 4.7.90 The above information should be presented in the form of condensed financial statements. The government may use graphs and charts to supplement, or elaborate on those statements, but not in place of them. 4.7.100 The MD&A should discuss and analyze the government’s financial position and results of operations. This discussion and analysis needs to address whether the government’s overall financial position has improved or deteriorated. The MD&A should provide reasons for the significant changes in financial position, not just changes in their size or percentage of change. The overall analysis discussion needs to address separately the governmental and business-type activities. This discussion should emphasize the current fiscal period. 4.7.110 The fund analysis focuses on the analysis of significant balances and operations of individual major funds. The discussion should emphasize the reasons for significant changes in fund balances (government funds) or fund net position (proprietary funds). Additional information should be provided on any significant limitation on the future use of fund resources. 4.7.130 The analysis should give reasons for variances if they significantly affect either future services or liquidity. 4.7.150 The RSI is not intended to repeat information provided in the notes, but should be summarized and references made to the more detailed information provided in the notes. 4.7.170 The MD&A should also address any currently known facts, decisions, or conditions that are expected to have a significant effect on financial position. This discussion should be based on events or decisions that have already occurred, or have been enacted, adopted, agreed upon, or contracted. In some instances, issues discussed here will also be disclosed in the notes to financial statements as subsequent events or contingencies. The discussion should also address the effect on governmental and business-type activities separately. 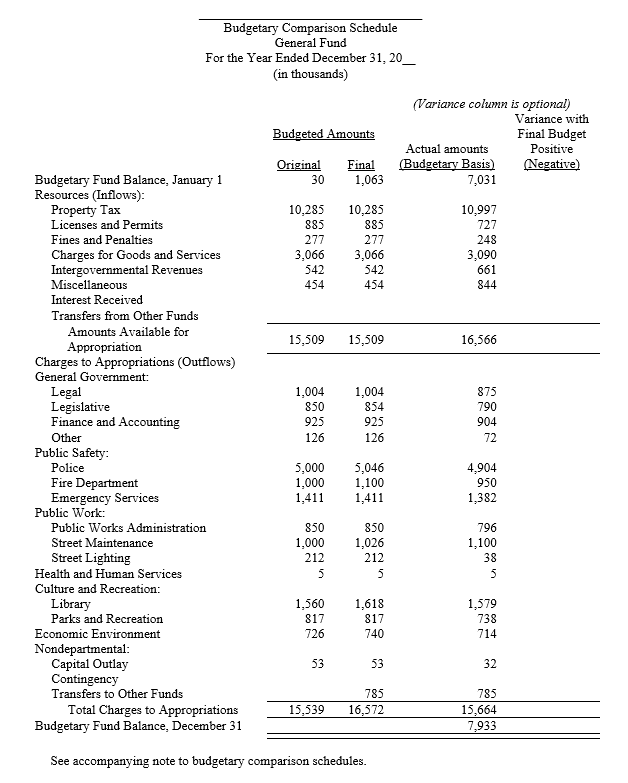 4.7.190 The budgetary comparison schedules should be presented in the RSI for the general fund and for each major special revenue fund  that has a legally adopted annual/biennial budget. However, governments may elect to report the budgetary comparison information in a budgetary comparison statement as part of the basic financial statements  rather than the RSI. The format and contents of the budgetary comparisons are the same for both presentations. 4.7.200 The budgetary comparison schedules should provide at least three separate types of information. The original budget – the first complete legally appropriated budget adjusted for changes occurring before the beginning of fiscal year. The original budget should also include actual appropriation amounts automatically carried over from prior years by law. The final budget – including all legally authorized changes including those occurring during and after the end of fiscal year. Actual inflows, outflows and balances – should be reported on the same basis as the legally adopted budget. 4.7.220 Governments may present the budgetary comparison schedule using the same format, terminology, and classification as the budget document, or using the format, terminology, and classifications in a statement of revenues, expenditures, and changes in fund balances. Regardless of the format used, the schedule should be accompanied by information (either in a separate schedule or in notes to the RSI) that reconciles budgetary information to GAAP information. 4.7.230 Governments with significant budgetary perspective differences  that result in the government not being able to present budgetary comparisons for the general fund and each major special revenue fund are required to present budgetary comparison schedules as RSI based on the fund, organization or program structure that the government uses for its legally adopted budget . These governments generally should present budgetary comparison for the activities that are reported in the general fund and each major special revenue fund. In summary, the governments with significant perspective differences: (1) present budgetary comparison, (2) format the budgetary comparison using the budgetary framework, and (3) present the budgetary comparison as RSI rather than as a basic financial statement. The results of the three most recently  completed condition assessments to demonstrate the assets have been maintained at or above the condition level established. The estimated annual amount needed and actual amount expensed to maintain or preserve infrastructure assets at the level established (presented for each of the past five reporting periods). The estimated annual amount must be determined using the assets management system. It should be calculated at the beginning of the fiscal year and documented providing an auditor with information necessary for the comparison of estimated and actual amounts. The basis for the condition measurement and the measurement scale used to assess and report condition. The condition level at which the government intends to preserve its infrastructure assets (reported using the modified approach). Factors that significantly affect trends in the information reported in the required schedules, including any changes in the measurement scale, the basis for the condition measurement, or the condition assessment methods used during the periods covered by the schedules. If there is a change in the condition level at which the government intends to preserve the eligible infrastructure assets, an estimate of the effect of the change on the estimated annual amount to maintain and preserve those assets for the current period also should be disclosed. 4.7.263 The schedules should include notes describing significant methods and assumptions used in calculating the actuarially determined contributions. Also, the governments should disclose information about factors that significantly affects trends in the amounts reported (e.g., changes of benefit terms, changes in the size or composition of the population covered by the benefit terms, or the use of different assumptions, etc.). 4.7.267 The schedules should include notes regarding information about factors that significantly affects trends in the amounts reported (e.g., changes of benefit terms, changes in the size or composition of the population covered by the benefit terms, or the use of different assumptions, etc.). 4.7.340 GASB Statements 43 and 45 require presentation of required supplementary information (RSI). The amount of extent of information that must be presented will depend upon which statements apply to your entity and the type of OPEB plan you participate in. If both statements apply RSI information does not need to be duplicated. For information on which standards apply to the government refer to Other Postemployment Benefits (OPEB). a. The required schedules are included with the plans financial statements in a publicly available, stand alone plan financial report. b. The employer includes in its notes to the financial statements information about how to obtain the stand alone plan report. 4.7.360 If the financial statements and required schedules of the plan (whether single-employer, agent, or cost sharing) are not publicly available in a stand alone plan financial report, the employer should report both schedules for each plan included in the employer’s report for all years required by GASB Statement 43. This statement requires sole and agent employers to present a schedule of funding progress and disclose in notes to the RSI factors that affect identification of trends. These disclosures would include changes in benefit provisions, size or composition of plan membership, or actuarial methods or assumptions. 4.7.380 Additionally if a sole or agent employer participates in a cost sharing plan that did not prepare a stand alone report they will need to present a schedule of employer contributions. For plans with a total membership of 200 or more – at least biennially. For plans with a total membership of fewer than 200 – at least triennially. The dollar amount applicable to that year. The percentage of ARC that was recognized in the plan’s statement of changes in plan net position for that year as contributions from the employer(s). When the plan’s funding policy includes contributions from sources other than the plan members and employer’s (for example, contributions from a state government to a local government plan), the contributions by those entities should be included in the schedule of employer contributions. In this case the schedule should be titled schedule of contributions from the employer(s) and other contributing entities. The OPEB schedules should be accompanied by disclosure of factors that significantly affect the identification of trends in the amounts reported in the required schedules. These factors include changes in benefit provisions, size or population covered by the plan, or actuarial methods or assumptions used. When changes occur in the factors discussed above the amounts for prior years should not be restated. 4.7.420 The sample required supplementary information which follow was designed to provide the disclosures required for public entity risk pools. They are intended to furnish you with ways of phrasing the needed disclosures. Be sure to revise these sample documents to fit the unique circumstances of the pool, to delete disclosures that do not apply to the pool’s operations, and to add others that we did not include but which are needed to help a reader understand the financial statements. 4.7.430 The following revenue and claims development information should be included as required supplementary information immediately after the notes to financial statements in the pool’s financial reports. a. Amount of gross premium (or required contribution) revenue and reported investment revenue, amount of premium (or required contribution) revenue ceded, and amount of net reported premium (or required contribution) revenue (net of excess insurance or reinsurance) and reported investment revenue for each of the past ten fiscal years including the latest fiscal year. b. Amount of reported unallocated claim adjustment expenses (GASB Statement 10, paragraph 23) and reported other costs (GASB Statement 10, paragraph 31) for each of the past ten fiscal years including the latest fiscal year. c. Total gross amount of incurred claims and allocated claim adjustment expenses (both paid and accrued before the effect of loss assumed by excess insurers or reinsurers), loss assumed by excess insurers or reinsurers (both paid and accrued), and total net amount of incurred claims and allocated claim adjustment expenses (both paid and accrued). Amounts should be presented as originally reported at the end of each of the past ten accident years (for occurrence-based policies or contracts), report years (for claims-made policies or contracts), or policy years including the latest year. Amounts should be limited to provisions for claims resulting from events that triggered coverage under the policy or participation contract in that year. If amounts are not presented on an accident-year basis or a report-year basis, they should be reported on a policy-year basis. The basis of reporting should be used consistently for all years presented. d. The cumulative net amount paid as of the end of the accident year, report year, or policy year (as appropriate) and each succeeding year for each of the incurred claims and allocated expense amounts presented in (c) above. e. The reestimated amount for loss assumed by excess insurers or reinsurers as of the end of the current year for each of the accident years, report years, or policy years (as appropriate) presented in (c). 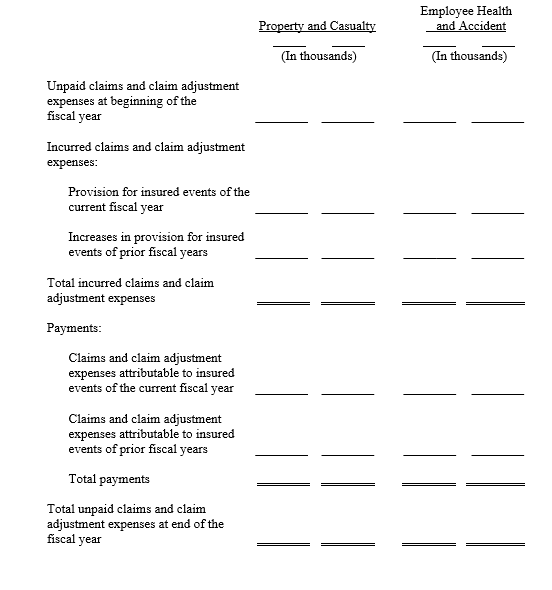 f. The reestimated amount for net incurred claims and claim adjustment expenses as of the end of each succeeding year for each of the accident years, report years, or policy years (as appropriate) presented in (c). g. The change in net incurred claims and claim adjustment expenses from the original estimate, based on the difference between the latest reestimated amount presented in (f) above for each of the accident years, report years, or policy years (as appropriate) and the original net incurred claims and claim adjustment amounts reported in (c). Percentage information (for example, the percentage of gross incurred claims and claim adjustment expenses assumed by excess insurers or reinsurers) may be presented but is not required. If presented, this information should not obscure or distort required elements of the table. 2. 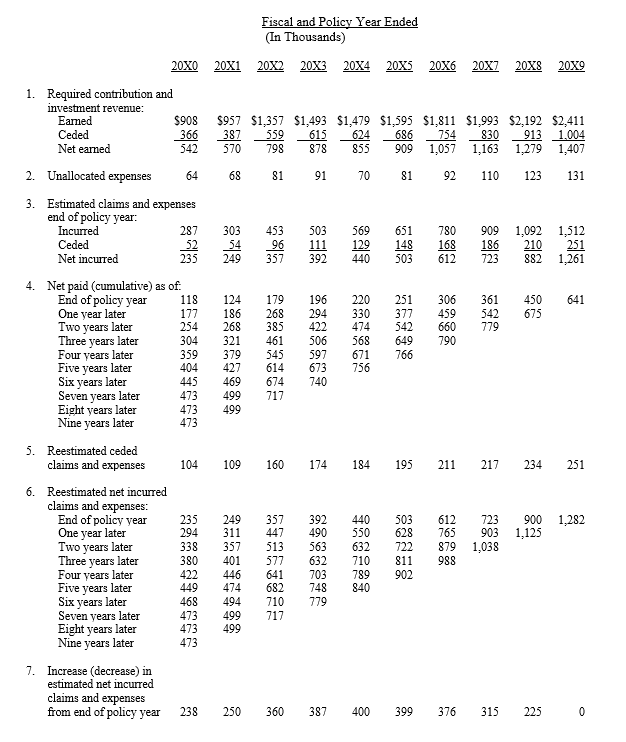 In addition to the reconciliation of total claims liabilities (GASB Statement 10, paragraph 49g), a reconciliation of claims liabilities by type of contract, including an analysis of changes in liabilities for claims and claim adjustment expenses for the current fiscal year and the prior year, in the same tabular format required by the GASB Statement 10, paragraph 49g. If a pool has only one type of contract the reconciliation is not required as the information is included in the notes to the financial statements. 3. During the transition period when the ten years of information about claims liabilities and claim adjustment expenses may not be available, all information required by item (1) above should be presented only for as many years as that information is available. If changes in a pool’s loss, expense, reinsurance, excess insurance, or other transactions materially affect pool revenues, expenses, or liabilities in a manner not fairly disclosed or presented in the tables above, the pool should expand these disclosures to show additional detail (such as separate information for each type of contract) to keep the schedules from being misleading or to keep trends from becoming obscured. This required supplementary information is an integral part of the accompanying financial statements. 1. This line shows the total of each fiscal year gross earned contribution revenue and investment revenue, contribution revenue ceded to reinsurers, and net earned contribution revenue and reported investment revenue. 2. This line shows each fiscal year’s other operating costs of the pool including overhead and claims expense not allocable to individual claims. 3. This line shows the pool’s gross incurred claims and allocated claim adjustment expenses, claims assumed by reinsurers, and net incurred claims and allocated adjustment expenses (both paid and accrued) as originally reported at the end of the first year in which the event that triggered coverage under the contract occurred (called policy year). 4. This section of ten rows shows the cumulative net amounts paid as of the end of successive years for each policy year. 5. This line shows the latest reestimated amount of claims assumed by reinsurers as of the end of the current year for each accident year. 7. This line compares the latest reestimated net incurred claims amount to the amount originally established (line 3) and shows whether this latest estimate of net claims cost is greater or less than originally thought. As data for individual policy years mature, the correlation between original estimates and reestimated amounts is commonly used to evaluate the accuracy of net incurred claims currently recognized in less mature policy years. The columns of the table show data for successive policy years. The schedule below presents the changes in claims liabilities for the past two years for the pool's two types of contracts: property and casualty and employee health and accident benefits. Currently known is interpreted as known by the managers as of the date of the auditor’s end of audit fieldwork. All major special revenue funds, whether designated as major based on the percentage criteria or management's discretion, are subject to this requirement. A government electing to present the required budgetary comparison information in the basic financial statements should include it with the fund financial statements after the related Statement of Changes in Revenues, Expenditures, and Changes in Fund Balance. The perspective difference may be related to special revenue funds which have their own legally approved budgets, but which do not qualify as special revenue funds per GASB Statement 54 and are included in the general fund for external reporting purposes. GASB Statement 41, Budgetary Comparison Schedule – Perspective Differences. As required by the GASB Statement 67, Financial Reporting for Pension Plans and the GASB Statement 68, Accounting and Financial Reporting for Pensions. See the GASB Statement 10, Accounting and Financial Reporting for Risk Financing and Related Insurance Issues, Statement 30, Risk Financing Omnibus and Statement 31, Accounting and Financial Reporting for Certain Investments and for External Investment Pools.